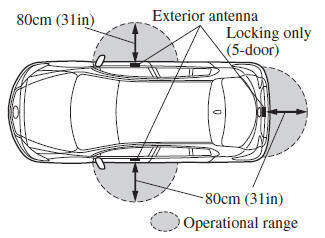 The system operates only when the driver is in the vehicle or within operational range while the key is being carried. 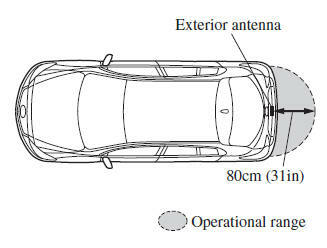 NOTE When the battery power is low, or in places where there are high-intensity radio waves or noise, the operational range may become narrower or the system may not operate. For determining battery replacement, Refer to Keyless Entry System on . NOTE The system may not operate if you are too close to the windows or door handles, or liftgate.